As part of our journey, we researched a fallen soldier from Minnesota who is buried in the American Cemetery in Normandy, France. We created a website to tell his story in his honor and delivered a memorial to him at the Normandy Cemetery in June 2013. Click the title above or the button below to learn so much more about a MN soldier. After being drafted he was sent to Camp Barkeley, near Abilene, Texas for training. While at Camp Barkeley, he auditioned for and was selected to be a French horn player in the 90th Division Band (Donnie was inspired to take up the French horn because of this and played one for many years) . The band was sent to England in April, 1944, and just before the Normandy invasion, all members were made medics and litter-bearers. They landed on Utah Beach on June 8. 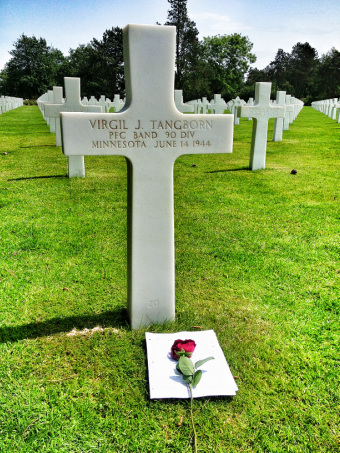 Virgil was killed on June 14 while attempting to rescue a wounded soldier during an intense Nazi artillery barrage on an ammunition dump on the Cherbourg Peninsula. He was posthumously awarded the Silver Star for gallantry, and is buried at the American Military Cemetery, Omaha Beach, St. Laurent, France.